In our series of letters from African journalists, broadcaster and media trainer Joseph Warungu reflects on Kenya's efforts to curb hate speech. But you who speaks a different tongue, you from a different village, you in a different class, you from a different faith. And yes, you with a different viewpoint. These are some of the written, spoken, whispered and silent or implied sentiments being expressed by some Kenyans, especially political leaders. Indeed, judging by the number of recent warnings from authorities, police summons and discussions among people, there is quite a bit of hatred being traded in Kenya today. As I write this the Kenyan government, troubled by continued hate talk online has just launched a new hashtag, #StopHatespeechKenya to "ensure hate messages are kept at bay". This move comes just two days after Kenya's police chief announced that his force is investigating hate leaflets circulating in Lamu, an area of coastal Kenya that has witnessed a wave of killings in recent days. Much of the hate talk is politically motivated but some of it is just cover for deep-seated ethnic and religious rivalry. Having gone through the trauma of the violence that followed the 2007 general elections, Kenya is always nervous of events and utterances that could trigger these memories or worse still provoke a repeat of the mayhem. And so the country is armed with a statutory bulldog (although some say it has only one tooth) that barks whenever anyone utters a breath of hate. Established in 2008 in response to the post-election violence, the National Cohesion and Integration Commission (NCIC), is charged with facilitating and promoting equality of opportunity, good relations and peaceful coexistence between people of different ethnic and racial backgrounds in Kenya. In the past, the NCIC monitored hate speech in the media and at public rallies, leading to the arrest of a few public figures, including musicians - but hardly anyone of substance to make an example of. It didn't help that at some point comedians and artists found themselves severely restricted, as their staple of jokes based on ethnic stereotypes were deemed to verge on hate speech. This led to an ongoing debate - where does freedom of expression end and hate speech start? Global experience has shown that it is extremely difficult to regulate or arrest people's mouths - especially political ones that usually have a mind of their own. So, despite efforts by the NCIC and the police, hate speech is rife, especially online. And given the level of vitriol, it is doubtful whether the government anti-hate speech hashtag will make much difference. Hate talk amongst politicians picked up speed in the lead-up to a rally organised on 7 July by the opposition Coalition for Reforms and Democracy (Cord) to demand action to solve the economic, political and security problems facing the country. Moses Kuria, an aspiring MP from the governing Jubilee Coalition, was charged with hate speech for a message he posted on Facebook, which the prosecution said amounted to incitement of ethnic hatred. Cord leader and former Prime Minister Raila Odinga, on the other hand, has in the last fortnight found himself at the centre of a private prosecution by a man who is accusing him of hate speech over allegedly inflammatory words he uttered at a rally earlier in the year. With the introduction of tougher laws to curb incitement and as Kenyans have tried to deal with the violence often provoked by the powerful, the politicians have become cleverer with their language. Hate speech is now covert and employs seemingly harmless but loaded words. But the audience gets it. And the speaker knows full well they do. "Removing of weeds" takes a very different connotation from ordinary farming. The audience knows it is the impending destruction and displacement of a community. Reference to the "foreskin" ceases to have a biological or anatomical context. It points to a rival community with the full chauvinism and disdain intended by the speaker. Over the years, hate speech has also migrated online where the cover of relative anonymity has provided a fertile ground. iHub, Nairobi's famous innovation hub for the technology community, has been running a huge research project in Kenya monitoring hate speech online and is now extending its experience to Nigeria. Facebook has been the predominant medium of hate. The year-long iHub research found that in 2013 more than 90% of online "dangerous speech", with potential to catalyze violence, was found on Facebook. The Communications Authority of Kenya (CAK) has warned that "some broadcast stations are taking advantage of the prevailing political situation in the country to air content containing hate speech". CAK threatened to take regulatory action, including withdrawal of broadcast frequencies from the offending stations. 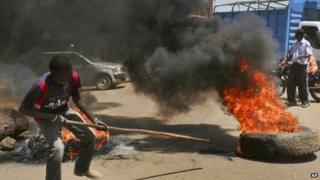 Despite scepticism by jittery authorities, Cord's rally passed off peacefully. And so too did the opportunity pass to tone down hate speech and lower political temperatures by means of a constructive national dialogue between the government and the opposition as demanded by Cord. The Kenyan government does not have a very good history of dialogue with its opponents. The opposition, too, does not have a reputation for much patience. The gap created by this polarity is often filled by rhetoric and hate talk. Years ago, when then-President Daniel arap Moi was facing stiff opposition, he often responded harshly to any calls for political dialogue. Any attempt to end his one-party rule and expand the democratic space by introducing a multi-party political system was met with maximum force. A funny story is told of how one semi-educated prominent politician, who was extremely loyal to Mr Moi, advised him to appease university students who were holding protests to demand dialogue. "Your government has a lot resources, so if all that these young people want is just dialogue, you can afford to give them - let them eat it," counselled the man, assuming that dialogue was a kind of food that was missing from the university cafeteria. I can't quite vouch for the accuracy of this quote, but I can confirm that hate speech is getting to worrying levels in Kenya and has prompted some to think hard about possible solutions. Many Kenyans are beginning to fight back against hate, especially online. iHub researchers say that they are seeing a lot more self-regulation, with people now more likely to call out use of hate speech. But judging by the Kenyan government's hashtag war against hate speech online, it may be a long while before the digital space is declared safe. This year, Rwanda has been marking 20 years since the genocide, while South Africa is looking back 20 years since the end of apartheid. Using these historic cases and other examples of hate speech in Kenya, South Sudan, Nigeria, the Central African Republic and elsewhere, the African Media Initiative - the continent's largest association of media owners and operators and which I sometimes work with - has chosen to focus on hate speech during its annual meeting in Johannesburg in November. These are the steps of just a few of those determined to stop Kenya and Africa continuing to sing: "Hate me babe one more time". If you would like to comment on Joseph Warungu's column, please do so below.